Americans who were interested in the antiquities and culture of Ancient Egypt found this book by Ernest Budge, Keeper of Egyptian and Assyrian Antiquities at the British Museum, to be a very useful guide. Budge, who spent many archaeological seasons in Egypt and West Asia between 1886 and 1913, wrote a number of books on Egyptian antiquities as well as the autobiographical work, By Nile and Tigris, published in 1920. The volume displayed here was published by the London travel firm of Thomas Cook and Son and presented to all travellers on Nile cruises that were arranged through the Cook agency. Budge, Keeper of Egyptian and Assyrian Antiquities at the British Museum, spent many archeological seasons in Egypt and West Asia between 1886 and 1913. This volume, published by the travel firm of Thomas Cook and Son, was presented to all traveler's on Cook's Nile cruises. "Experience has shown that the greater number of travellers in Egypt are more interested in the remains and civilization of the ancient Egyptians than in the history of Egypt under the rule of the Persians, Ptolemies, Romans, Arabs, and Turks" (p.vii). Amelia Blanford Edwards' work emphasized the importance of properly excavating and preserving Egyptian antiquities. During a trip to Egypt in 1873-1874, Edwards, a British citizen who began her career as a popular novelist, became so fascinated by the country that she devoted the remainder of her life to the study of its history and antiquities. Edwards instilled in her readers an appreciation and respect for Egypt and its culture. 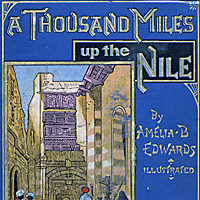 First published in 1877, A Thousand Miles Up the Nile appeared in numerous editions, as recently as 1993. Intended to give Western visitors to Egypt, whether scholars or tourists, enough background information to enrich their understanding of the places and things they saw, her book was regularly consulted by American visitors to Egypt. This "all-in-one" volume was designed for the American traveller who made a tour of Europe before setting off on a Nile adventure. Well-stocked with maps, plans of archaeological sites, and hotel information, the pliable leather binding with flap enclosure helped to protect the contents from the vagaries of nineteenth-century travel. 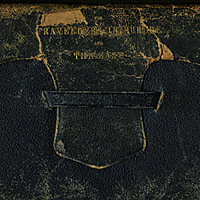 This well-worn edition was carried on her travels by Lucy H. Baird, daughter of the Smithsonian's second Secretary, Spencer F. Baird. Baedeker's little red Handbooks have been a staple in travellers' luggage since the early nineteenth century. 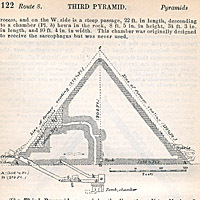 The publisher's first guide to Egypt appeared in 1878, with contributions from noted Egyptologists Georg Ebers and Samuel Birch. The maps and plans in the Handbook were based on the work of German archaeologist and explorer Richard Lepsius, among others. Baedeker originally devoted two volumes to Egypt, with volume one covering "Lower Egypt" (the area around the mouth of the Nile, including Alexandria, Cairo, the Giza pyramids, and the sites of the Sinai peninsula) and volume two devoted to "Upper Egypt" (Nubia and the area south to Aswan and the Second Cataract). As travellers' itineraries extended to encompass the entire area, Baedeker condensed the two volumes into one in 1902. Baedeker's little red Handbooks have been a staple in travellers' luggage since the early nineteenth century. The publisher's first guide to Egypt appeared in 1878, with contributions from noted Egyptologists Georg Ebers and Samuel Birch. The maps and plans in the Handbook were based on the work of German archaeologist and explorer Richard Lepsius, among others. 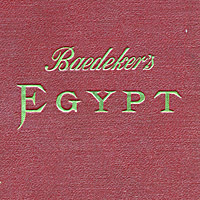 Baedeker originally devoted two volumes to Egypt, with volume one covering "Lower Egypt" (the area around the mouth of the Nile, including Alexandria, Cairo, the Giza pyramids, and the sites of the Sinai peninsula) and volume two devoted to "Upper Egypt" (Nubia and the area south to Aswan and the Second Cataract). As travellers' itineraries extended to encompass the entire area, Baedeker condensed the two volumes into one in 1902. The 1892 edition displayed here was owned by Lucy H. Baird, daughter of the Smithsonian Institution's second Secretary, Spencer F. Baird. Baedeker's little red Handbooks have been a staple in travellers' luggage since the early nineteenth century. The publisher's first guide to Egypt appeared in 1878, with contributions from noted Egyptologists Georg Ebers and Samuel Birch. The maps and plans in the Handbook were based on the work of German archaeologist and explorer Richard Lepsius, among others. 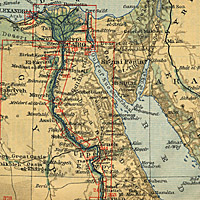 Baedeker originally devoted two volumes to Egypt, with volume one covering "Lower Egypt" (the area around the mouth of the Nile, including Alexandria, Cairo, the Giza pyramids, and the sites of the Sinai peninsula) and volume two devoted to "Upper Egypt" (Nubia and the area south to Aswan and the Second Cataract). As travellers' itineraries extended to encompass the entire area, Baedeker condensed the two volumes into one in 1902. 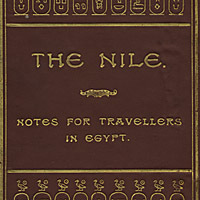 The introduction to the 1885 Handbook promotes Egypt to adventurous Western travellers: "Owing to its distance from the homes of most travellers, and to the expense involved in exploring it, Egypt will never be overrun by tourists to the same extent as Switzerland or Italy....[but] its unrivalled attractions abundantly reward the enterprising traveller." 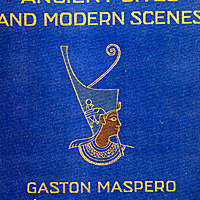 American travellers read works by Maspero, director of Egypt's Antiquities Service, who wrote a number of popular books as well as scholarly treatises on Egypt. One of the nineteenth century's greatest Egyptologists, the French-born Maspero was responsible for securing Egypt's archaeological treasures for the Egyptian Museum in Cairo. The book shown here, a translation of his Ruins et paysages d’Égypte (1910), was popular with visitors to Egypt. 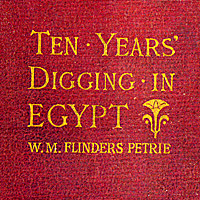 One of the great British archaeologists in Egypt, Petrie helped to define the modern discipline of Egyptology. He was an early member of the Egyptian Exploration Society and a professor at the University of London. He wrote popular works read by a wide audience including this account of the daily life of an archaeologist in Egypt. 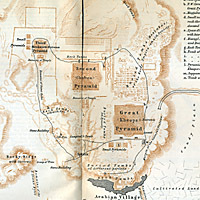 This early guidebook to Egypt, published for guests staying at the hotel, contains maps, site plans, and general tips for travellers. 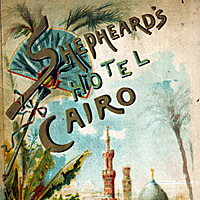 The original building was destroyed in 1952, and the New Shepheard's Hotel, still in operation, opened in 1957.